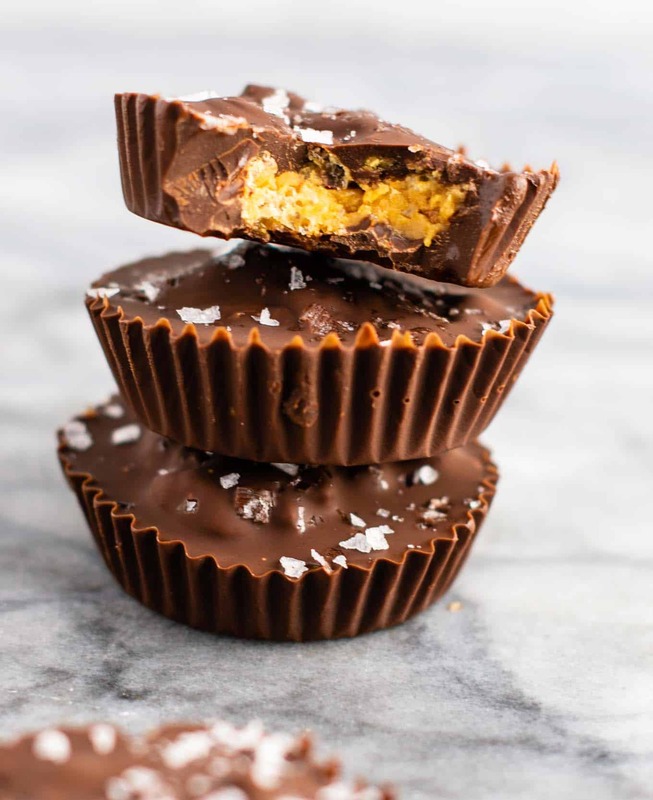 Chocolate peanut butter crunch cups are my latest homemade candy obsession. 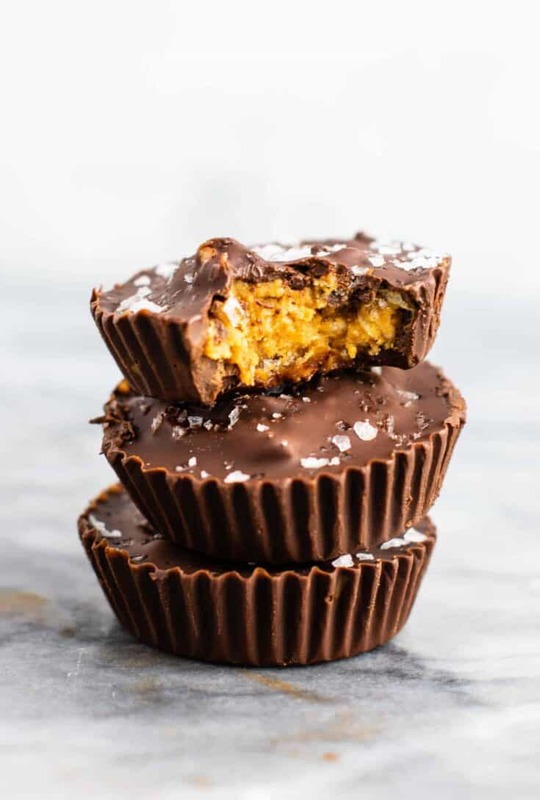 For years I have loved wow-ing people with my homemade reese’s cups recipe. 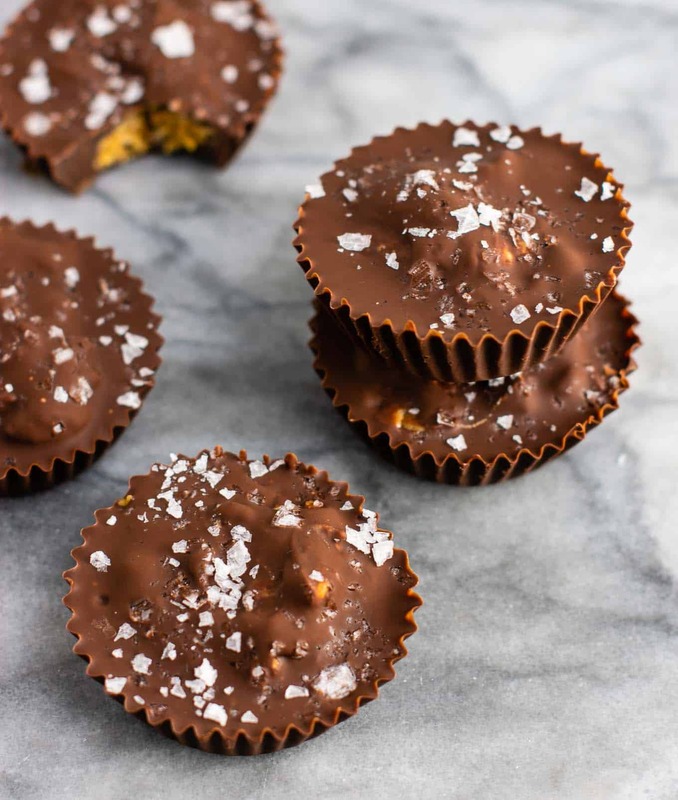 These chocolate crunch cups are very similar, but include crispy rice cereal in the peanut butter filling and flaked sea salt on top. 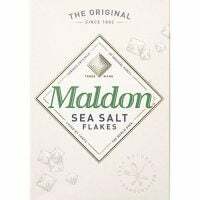 This results in the ultimate chocolate-y crunchy sea salt bite that is better than any candy I have ever bought in a store. Honestly, you wouldn’t even believe these little treats are vegan and gluten free. Everyone will be too busy eating them and begging you for the recipe! 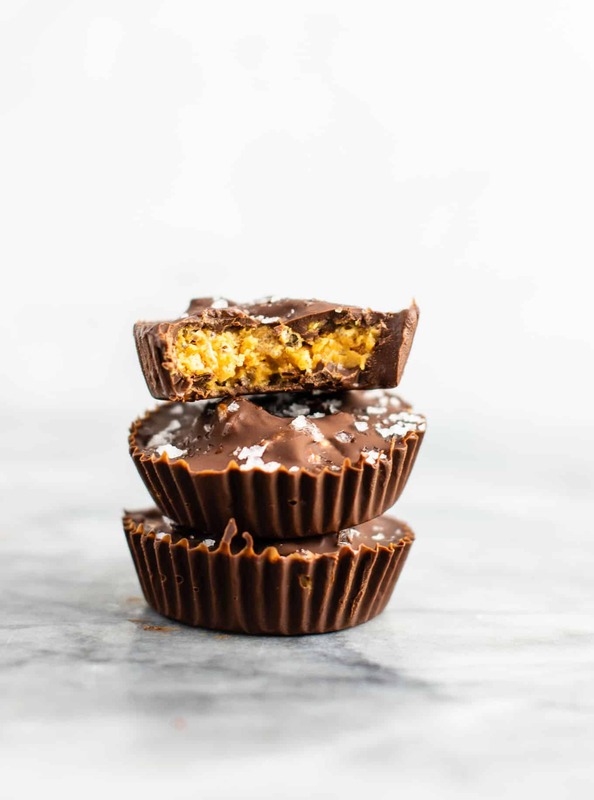 These no bake peanut butter crunch cups are so simple to make, but look impressive. That is my favorite kind of dessert – one that looks like I spent a lot of time making but doesn’t require a ton of effort. First, you will add a bag of semi sweet dairy free chocolate chips to a small sauce pan with 2 tablespoons of coconut oil. Melt over low heat, and stir often to avoid burning. Once melted, stir in the vanilla extract and remove from the heat. Next, stir together your peanut butter and maple syrup until combined. Add in the crispy rice cereal and stir until it’s well incorporated. 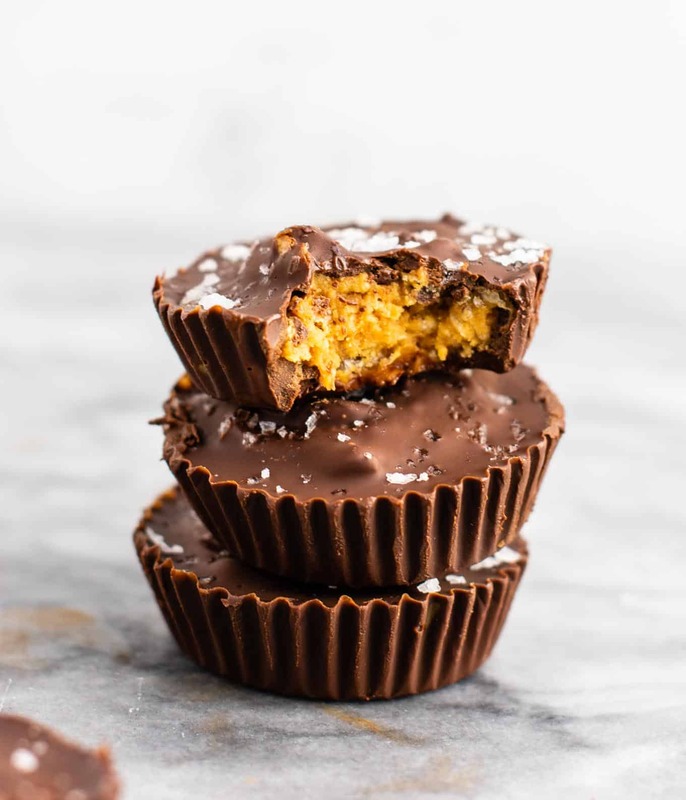 You are now ready to make your chocolate peanut butter crunch cups! First, line a muffin tin with 12 liners. Add 2 teaspoons of the chocolate into each liner, then shake/pat the pan on a hard surface for the chocolate to settle evenly. Next, distribute your crispy peanut butter filling evenly among the 12 cups. Drizzle remaining chocolate over the tops of the cups. 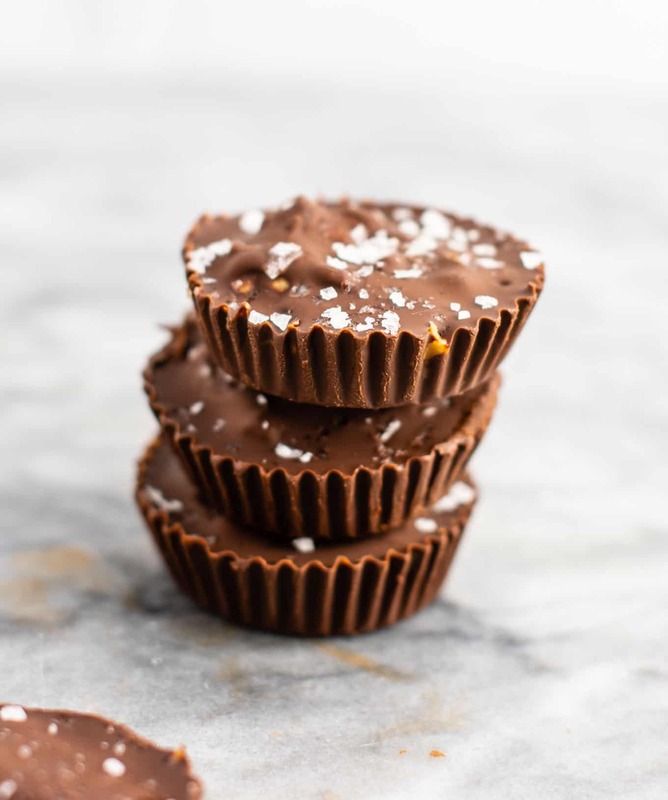 If your peanut butter is sticking up, use a spoon to smooth the tops so that only chocolate is seen and they lay relatively flat on top. Sprinkle tops generously with flaked sea salt. Now take a bit and let it sink in just how incredibly delicious that was! I don’t know about you, but these are at the top of my Christmas baking list this year. I will be making them again and again! Keep in mind that these will start to melt at room temperature, so they are best stored in the fridge or freezer. 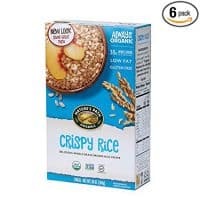 Be sure to buy crispy rice cereal that is certified gluten free to ensure that this recipe is gluten free. If you don’t need it to be, any crispy rice cereal will do just fine. I love mine straight out of the freezer and they are the perfect grab and go dessert! 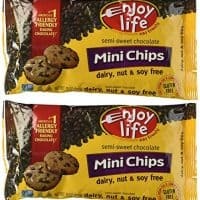 They are also undoubtedly more healthy than a packaged dessert, and made with all easy to recognize ingredients. Ready for the freezer in just 15 minutes of time. Just 15 minutes stands between you and the most delicious thing you’ll eat this week. Hungry for more delicious no bake treats? Here are some of our favorites to keep on hand in the freezer! In a sauce pan, melt chocolate chips and coconut oil over medium low heat. Stir often to avoid burning. Drizzle remaining chocolate sauce over the tops. How much of a maple syrup taste is there? I really dislike the taste of maple syrup and don’t want to waste my time making these if that’s what I’m going to taste.